Valleyview 3rd Graders Find Success! International textbook publishing company Marshall Cavendish Education has agreed to correct a factual error in one of their textbooks as a direct result of Dr. Ken Sider's 3rd grade class at Valleyview Elementary School petitioning them to do so. 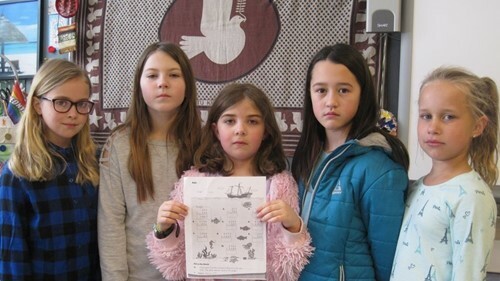 After writing four letters to the company and receiving only form letters in return, the students crafted a petition in March using change.org, asking individuals to support their drive to have the textbook company correct the incorrect statement that Columbus had landed in America in 1492. Columbus, as the students knew, had actually landed in the Caribbean in 1492, and eventually the online petition earned over 1,000 signatures. The third grade class received a letter from Marshall Cavendish Education on April 2nd that promised future editions of the textbook will be corrected in order to be more accurate. Early in the project, the students consulted with historian and Valleyview parent, Dr. Alexandra Tolin Schultz. Perseverance finally paid off for these third graders from Valleyview Elementary School.